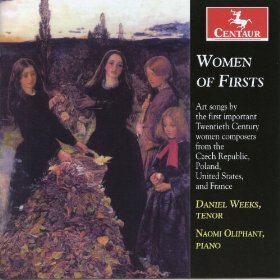 Women of Firsts | Daniel Weeks | Dispeker Artists, Inc. The 13-song cycle Clairières dans le ciel by Lili Boulanger, younger sister to the famed teacher Nadia Boulanger, to a set of hazily evocative prose poems by the French Symbolist writer Francis Jammes, may be the highlight. As Oliphant points out in her notes (given in English only), the set is usually sung by women but was probably composed for a male singer who may have been Boulanger's lover; it is a chronicle of a love affair, sometimes pretty passionate, from the male point of view.